A precise answer to this question remains largely unknown. Sleep is a phenomenon common to all animals in some form. This universality suggests that the act of sleeping likely has some evolutionary relevance. Humans spend approximately one-third of their life, or about eight hours per night, sleeping. Certainly, we feel better when we sleep well. Sleep is not a homogenous process and appears to go through multiple discrete cycles during any given night. We gain insight into these various stages by using devices which measures the electrical patterns of the brain – the electroencephalograph (EEG); muscle tone of the body – is measured by the electromyograph (EMG); and for eye movements, the electro-oculography (EOG). All of this information is recorded simultaneously during sleep, and we gain a “window” into characteristic patterns. Naturally, all this information has to be tabulated, scored and interpreted. Scoring and interpretation of the various input waveforms are based on a set of “rules” developed by the American Academy of Sleep Medicine (AASM). Sleep can be broadly segmented into rapid eye movement (REM) sleep and non-REM (NREM) sleep. Wake— Adults are typically awake for at least two-thirds of the 24-hour day. As activities wind down, people recline and close their eyes. It is at this time that the brainwaves slow to a rhythm. This rhythm is the bridge between wake and sleep. When this rhythm slows further, sleep has arrived. NREM sleep— Most adults will enter sleep from the drowsy state via NREM sleep. According to the newer rules prescribed by the AASM, NREM sleep is divided into three sub-stages: stage N1, stage N2, and stage N3. Stage N1— Stage N1 sleep is the typical transition from wakefulness to sleep. It is characterized by low amplitudes of mixed EEG frequencies. Eye movements are typically slow and rolling. Stage N1 is the lightest stage of sleep; patients awakened from it usually do not perceive that they were asleep. Stage N1 sleep typically accounts for 5 to 10 percent or less of the total sleep time. Stage N2— Stage N2 generally comprises the most significant percentage of total sleep time, typically 45 to 55 percent of the night. Stage N3— Stage N3 sleep is frequently referred to as “deep sleep” or “slow wave sleep.” It is characterized by low frequency and high amplitude EEG waves. Stage N3 sleep typically accounts for 10 to 20 percent of the total sleep time in young to middle age adults and decreases with age. Stage N3 tends to occur more in the first half of the night and particularly at the beginning of the night. It is often more difficult to arouse sleepers during stage N3 sleep, and stage N3 is a typical time for NREM-parasomnias (such as sleepwalking) to occur. REM sleep (stage R)— REM sleep, also called stage R, is characterized by certain features. The EEG demonstrates a low voltage, sawtooth pattern. Rapid eye movements are the defining feature of the stage. EMG demonstrates “atonia” (or flaccid paralysis), indicating inactivity of all voluntary muscles (except the extraocular muscles and the diaphragm). Atonia is the result of direct inhibition of the central nervous system. Based on early studies in which patients were awoken out of REM sleep, REM sleep has typically been associated with vivid dreaming. 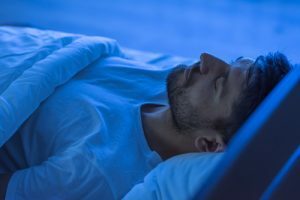 Although REM sleep accounts for less than a quarter of total sleep time it’s function may be a time of memory consolidation during which important memories are retained, and less critical neural connections are pruned. Why is the Sleep Cycle Important? REM sleep occurring soon after initial sleep onset might be indicative of narcolepsy or depression. Sleep fragmenting disorders, such as periodic limb movements may completely disrupt the regular cycling of sleep. The result may be a person who is chronically fatigued. Chronic fatigue may seriously disrupt a person’s lifestyle. Mood and sleep architecture are intricately related. Often a diagnosis of depression can be suggested by specific alterations in the sleep cycle. Sleep-related breathing disorders – such as central sleep apnea and obstructive sleep apnea can be fully elucidated during a sleep study test. Both of these disorders, if untreated, pose major health risks in the form of heart disease. On the other hand, risks may be mitigated by various treatment options. Are you struggling to sleep at night? Do you feel as though you aren’t getting a good enough night’s sleep to function during the day? If so, make an appointment with Dr. Brown and the OSA team today by calling (631) 983-2463 or contact us online.